The DOC (Death on Contact) is one awesome AUTO folder. 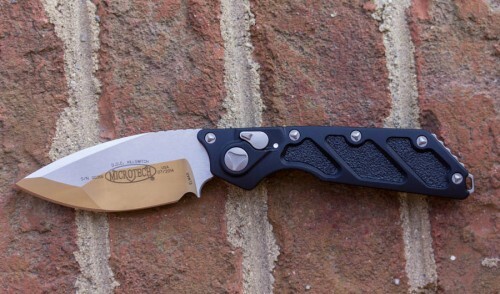 This collaboration between Mick Strider of Strider Knives and Anthony Marfione of Microtech, won Most Innovative Design and Collaboration of the Year at the 2013 BLADE Show. It’s large, tactical, rugged, fast, ergonomic and fun. The safety switch doubles as the push button for this folder and the grind lines on the blade are absolutely gorgeous. A great quality folding design you definitely can bet your life on. See it at www.knifecenter.com.